If you’d like to read the second instalment of this conversation, it’s available here. Viv: Hi Hākon, would you like to introduce yourself and tell us a bit about the class you are planning for. Hākon: I am a teacher at one of the largest primary schools in Reykjavik, Iceland. Currently, I teach a year 4 class of 45 students in a team with two other teachers. Mantle of the Expert is not widely used in Iceland, but I try to use as much as I can in my teaching. I have taught this same class for two years now so the students, as well as my colleagues, are familiar with Mantle of the Expert. Viv: You mentioned that you were keen to plan a Mantle of the Expert where the children would ‘build a society’ What gave you that idea? You also mentioned you’d prefer to set it in contemporary times, rather than make it historical. Can you explain more about that? Hākon: In the school where I teach, teachers are required to follow a school curriculum where they are required to teach certain things at certain times. At the beginning of the school year I was looking at the agenda for year 4 students which includes, among other things, map-reading/map-making, religion, government and culture. As I am required to teach these things to my students, I started thinking how they could be incorporated into a Mantle of the Expert. Government, religion and culture all play a vital role in society, so I thought that building a society would give my students interesting opportunities to think about and discuss these terms, what they mean and the roles they play in their own lives. The reason I would like it to be set in modern times is twofold. The first reason is I think that by placing the Mantle in modern times gives the students better opportunities to connect what they are learning to their personal lives. For example, I would like them to be able to think about their own values and preferences as of today while establishing a culture for their society, as opposed to them trying to imitate the culture of people a long time ago. The second reason is that I have already planned a Mantle around the settlement of Iceland which will take place next spring, and I don’t want to make them too similar. Viv: In Iceland, unlike NZ, you have a prescribed syllabus of certain ‘content’ you must teach at certain levels, is that right? Do you find that makes it easier or harder to use Mantle of the Expert? Hākon: Overall, I think it makes it harder. Prescribed content can inspire an idea for how to plan a Mantle, as was the case for the society building, but since Mantle of the Expert is a highly creative approach to teaching and learning I feel like any obligations and/or restrictions mostly work against it. Viv: And you have standardised tests as well? How does teaching in Mantle of the Expert fit with preparing for these? Hākon: Not at all to be honest. My year 4 class is at the moment preparing for a big standardised test in the end of september and I wouldn’t think using Mantle of the Expert to prepare them. A lot of the time that is spent preparing the students just goes towards showing them how a standardised test is conducted, which would make for an uninteresting mantle. Then there is the matter of standardised tests and Mantle of the Expert being almost polar opposites. Standardised tests measure if you know the answer to a specific question at a specific time while Mantle of the Expert does not look for specific answers but challenges students to make up creative solutions to open problems. It’s like water and oil, they don’t mix. Viv: OK, so if we want to create a Mantle of the Expert experience where children are building a new society, the first question we might ask ourselves is ‘who does this kind of thing in the real world?’ …. One idea that springs to mind is space exploration. Hākon: That was my first idea too! Students would take on the role of colonizers on a distant planet, establishing a new society. However I have some concerns about that idea. Viv: Space exploration is a logical idea because space is the one place where we are still finding new territory. At the same time, it’s an idea with a strong popular culture association. Real space travel is serious business, but most of us have mostly encountered the idea through movies and science fiction, therefore you’d need to be careful to be clear on whether things that belong in popular culture versions of space travel were allowed in to your imagined world. Hākon: I agree. My biggest concern about the mantle taking place in space would be that the focus might too easily shift away from society-building to space exploration, since it’s more exciting. Also, I’ve previously done a space mantle with the same class which focused on the solar system and I think they might have a hard time separating the two. Viv: Another idea might be a society that has to relocate and rebuild in a new place. This reminds me of the real-life example of the island community of Kiribati, which is experiencing the effects of sea rise. The government of Kirabati is planning ‘relocation with dignity’, which includes buying up land in other countries and creating a new home for themselves. Perhaps your commission could spring from something like that? Hākon: This sounds interesting. I can’t say I’m familiar with Kiribati’s situation, but it could work. It would make for a dramatic context with a real-world connection. Hākon: Yes! If the students were given a chance to immerse themselves in the lives of the people on the fictional island and the changes they have to undertake, then drawing a real-world connection in the end could be really powerful. Viv: Another question is how you want to frame the participants. Another way of putting this is to ask what their point of view will be. Do you want participants to be ‘puppet master’ type figures, arranging the details of this world, setting up the culture, observing and overseeing and guiding change? This is the sort of stance we might use in a rolling role approach. Or do you want them to be right IN the situation, going through it for themselves? This would be more like drama for learning. Or, do you want to use the ‘expert team’ perspective to create a collective concern – which is what Mantle aims to do… That would mean having a team of people with a particular ‘take’ on the situation. For example, if they were map makers, then their concern would be to accurately plot the layout of the new society. Or If they were city planners, they would be focused on planning for the needs of the citizenry. Or if they were counsellors, then their concern would be to advise the people setting up the new society on how to cope and how to make the new society work at a human level. I think any of these approaches could work and all could involve understanding the aspects you have talked about (government, social systems, culture etc) but with a different frame of concern, or point of view. And there are loads of other possibilities. 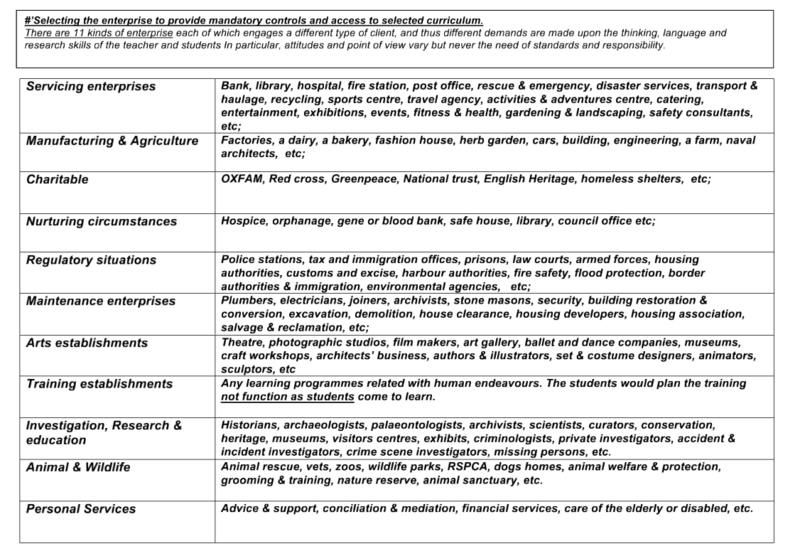 You can use Heathcote’s list of possible enterprises to help you choose. Of course, none of these is absolutely fixed… When using Mantle of the Expert you can still employ ‘drama for learning’ to take on the role of people in the situation… but your overarching concern would be whatever your group identity is. Hākon: I think you are right. I feel like I might go with a mixed approach, where the students take on a role of an expert team or puppet masters tasked with overseeing the actions needed for rebuilding the society, while also using drama for learning to examine the emotions that the island inhabitants are experiencing…I am getting all excited, I really like this idea! Viv: Fantastic – thanks Hākon. Good luck with the next stage of planning and we’ll talk again soon.